a little over a couple of months ago i bought a macbook pro and with it a copy of parallels thinking there may be times i need to pop back into windows for this or that (ok ok, the zenzui sdk is still windows only – but not for long). at any rate; i put off installing it for a bit because i was thoroughly enjoying having a mac again after a 10 year pc hiatus. on a cloudy quiet saturday i decided to open the box and take parallels for a spin. after a successful install i’m prompted to enter the activation key located on the white cd sleeve. one wee snag: there is no activation key on the cd sleeve, the cd itself, the box, in the manuals or on the little registration postcard. 1. find customer service number on swsoft.com makers of parallels. 2. an automated message tells me that swsoft customer support does not support parallels, instead i need to go to parallels.com and call their customer support number. 3. discover via the parallel’s support page that i will be charged $29.99 for my support call. 4. decide to circumvent said charge and call the sales office. after all for me it’s a local call as it’s a redmond, wa number. 6. call back just to make sure i’m not hearing things. 10. my explanation that i’ve tried and failed at #1 gets me nowhere. 11. attempt #1 again, but this time i wait until i get a human. 12. explain to human operator that i am calling in reference to parallels and once again instructed to go to parallels.com; and as i’m getting ready to hang up i share that all i really need is my stupid activation code. 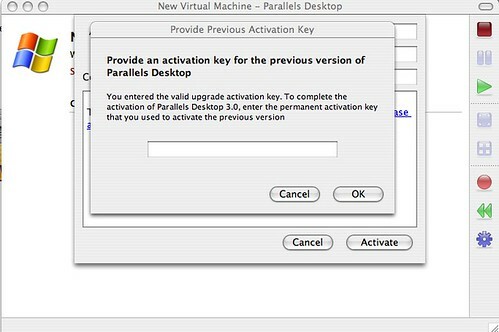 13. rejoicing was had when i’m told that the ONLY parallels support that swsoft offers is with regards to activation codes. yay! all i need to do is prove my purchase. 14. thankfully i chose to have the apple store email me my receipt at time of purchase so i’m able to email it to my swsoft helper bee. 15. he responds within minutes with an activation code! now we’re getting somewhere. 16. i enter the activation code and hit activate! 22. four minutes later get another code. no explanation or apologies or sympathy *boggles*. just a code. 23. i hold my breath and enter the new code in.